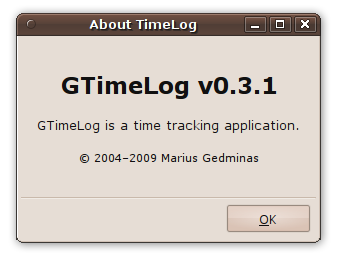 Back in 2004 I wrote a small Gtk+ app to help me keep track of my time, and called it GTimeLog. I shared it with my coworkers, put it on the web (on the general "release early, release often" principles), and it got sort-of popular before I found the time to polish it into a state where I wouldn't be ashamed to show it to other people. Fast-forward to 2008: there are actual users out there (much to my surprise), I still haven't added the originally-envisioned spit and polish, haven't done anything to foster a development community, am wracked by guilt of not doing my maintainerly duties properly, which leads to depression and burnout. So I do the only thing I can think of: run away from the project and basically ignore its existence for a year. Unreviewed patches accumulate in my inbox. It seems that the sabbatical helped: yesterday, triggered by a new Debian bug report, I sat down, fixed the bug, implemented a feature, applied a couple of patches languishing in the bug tracker, and released version 0.3 (which was totally broken thanks to setuptools magic that suddenly stopped working; so released 0.3.1 just now). Then went through my old unread email, created bugs in Launchpad and sent replies to everyone. Except Pierre-Luc Beaudoin, since his @collabora.co.uk email address bounced. If anyone knows how to contact him, I'd appreciate a note. There's a mailing list for user and developer discussions (if there still are any ;). GTimeLog's source code now lives on Launchpad (actually, I mentioned this on my blog once).